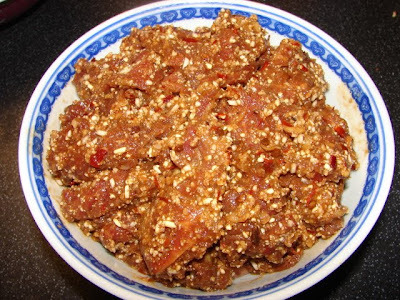 Fen zheng niu rou 粉蒸牛肉 or steamed beef with roasted rice is a popular Sichuanese dish. It's spicy beef coated with roasted glutinous rice. 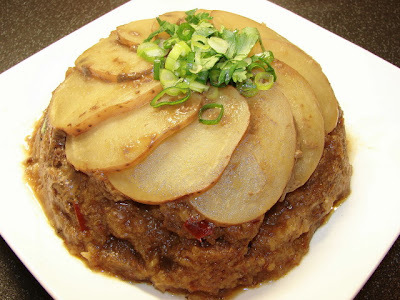 This dish can be presented in several ways, one is to steam the beef with a bamboo steamer. I don't really like using bamboo steamer because the meat juice will stain the bamboo making cleaning a pain. I prefer to use a large noodle soup bowl like this below, which can be presented as it is with a bit of garnish or inverted like the second picture. As you can see potato, taro or pumpkin can be used to line the bowl which I think is rather pretty and also it serves to absorb most of the meat juice making the dish rather dry. 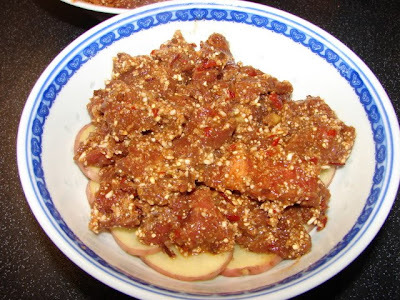 This beef dish is not good adding too much liquid as sauce, it will be absorbed by the glutinous rice making the beef coating really soft and gummy. There are few essential ingredients for this dish other than beef. The most important is the roasted rice. This is not ordinary rice but glutinous/ sticky rice. The rice is roasted on a dry pan till golden brown then coarsely ground. This rice gives the body and texture to the beef. 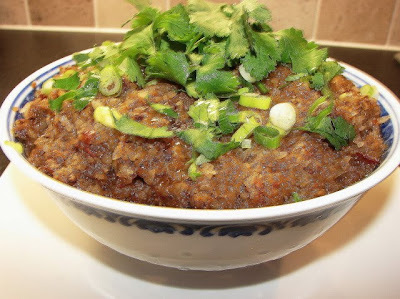 For flavouring the most important is chilli bean sauce or douban jiang. I am addicted to this sauce I cook quite a lot of Sichuan dishes quite regularly. Some of you who know me will know I don't like Lee Kum Kee chilli bean sauce. This brand of chilli bean sauce has been my favourite for a while. 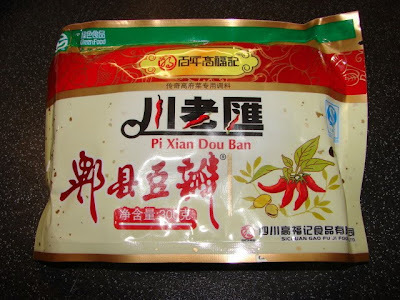 About a year ago I saw and bought authentic Sichuanese chilli bean sauce called Pixian douban jiang 郫县豆瓣酱 from London now available in most Chinese supermarkets everywhere in England. Pixian is a town in Sichuan where most of the famous Sichuan chilli bean sauces are produced. I really like this Pixian stuff, it's more pungent probably due to its long fermentation. I will continue to use Pixian from now on. If you like chilli bean paste I would recommend you look for the Pixian douban label, they can be in jars or bamboo weaved container. Here is one I bought last week in plastic packaging. 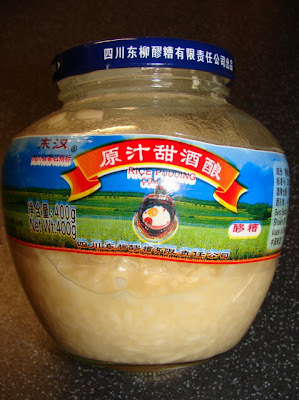 The next flavouring is a bit unusual, it's fermented rice juice 醪糟汁, i.e. it's partially fermented rice wine not completely filtered or distilled, it can have some rice grains still in it. It's quite easy to make your own, I will post a recipe later. If you like to buy some this is the closest match I can find in many Chinese supermarkets over here, see picture below. If you can't find this or prefer not to buy any you can always use Chinese cooking wine for this beef recipe. Now lets look at this beef recipe. This will serve 3 - 4 people as part of a various dishes meal. Trim away any gristle on the meat then cut into 0.5cm thick strips. 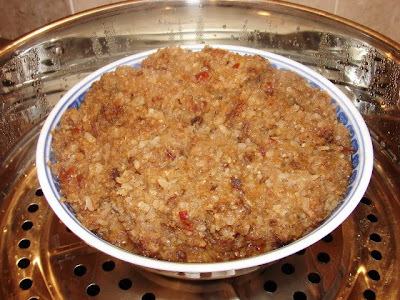 Dry roast the glutinous rice using a small frying pan at medium heat, keep the rice moving either with a stirrer or shake the pan. Roast till the rice is light golden brown. Leave to cool for few minutes then coarsely ground using a coffee grinder or mini blender. 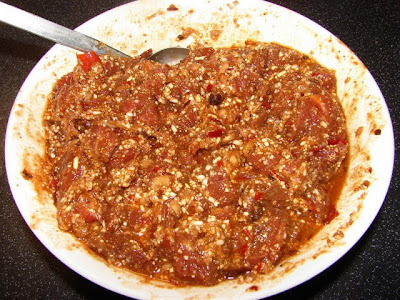 Mix the beef with the flavouring ingredients and ground rice. Leave this sit for about 10 - 15 minutes till rice has absorbed most of the liquid. 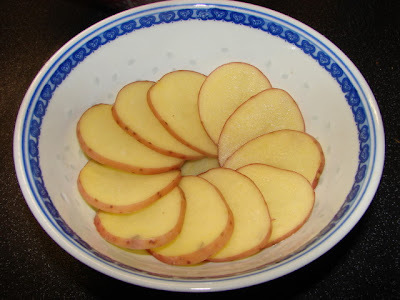 Cut potato into thin slices. Take a soup noodle bowl, arrange potato on the bottom of bowl then layer beef pieces on top, piece by piece. Do not pack the beef down or the rice may not cook evenly. If there is any rice grains left on the bottom of the mixing bowl, just spread this on top of the beef. Steam around 35 - 60 minutes. Time depends on your steamer power and quality of beef. Tougher beef will take longer. Try tasting around 35 minute, take a piece of meat from the centre if it is tender it's ready, if not steam for a bit longer. Serve as it is or invert the meat onto a dish. Garnish with a little spring onion and coriander. That looks fantastic. Presumably you could use a cheaper cut and steam it slower but for longer? Yes you can use a tougher cut. Just slice a lot thinner so it will cook faster. Another way is to cover the the meat with paper or foil loosely and steam longer. This is to prevent too much moisture (steam) being absorbed by the rice and makes it very soft. Thanks for the recommendation for a chili bean sauce - I too haven't been entirely happy with my Lee Kum Kee but had no idea what other brand to buy. thank you for reminding us about about the cheek for the head cheese..its been edited it to include it in the recipe..the ham hock is optional for a slightly more meaty texture. Great site you have here! Thanks for reading and commenting on our site so that we can discover yours!